This exhibition of film posters and stills represents a wide range of Hollywood, independent and foreign films that incorporate workplace and organizing themes. Many of the films presented here have helped bring public attention to important stories about worker safety, the exploitation of immigrant workers, impediments to achieving union recognition and other important issues. Many are also exceptional works of art. The exhibition is selected from a larger collection owned by the DC Labor FilmFest, made possible by the support and generosity of Jules Bernstein. Discover the art and architecture that made the Stewart Lee Udall Department of the Interior Building a "symbol of a new day" during the Great Depression. The Interior Museum Murals Tour lasts an hour and visits 26 photographic murals by Ansel Adams and many of the over forty mural panels painted by artists including Maynard Dixon, Allan Houser, Gifford Beal, and John Steuart Curry. All adults must present a photo ID and are subject to security screenings, including bag and parcel checks. Artist Ben Shahn’s stunning frescos -- “The Meaning of Social Security,” “Work, the Family, and Social Security” and “Child Labor, Unemployment, and Old Age” -- are as vibrant and meaningful today as when he created them in 1942. Don’t miss this rare opportunity to see these amazing artworks up close. Special bonus: Philip Guston’s huge mural “Reconstruction and the Wellbeing of the Family,” which is not a part of the usual general public tour. VOA is at 330 Independence Ave., S.W. Washington, D.C. 20237 but Please enter the building through the entrance on C Street. C Street is on the opposite side of the building from Independence Avenue between 3rd and 4th Streets. Tours begin in the lobby of the C Street entrance. “The Struggle for Justice” tour showcases the determined men and women, from key nineteenth-century historical figures to contemporary leaders, who struggled to achieve civil rights for disenfranchised or marginalized groups. The hour-long tour features more than forty photographs, paintings, posters, buttons and sculptures, includes portraits of civil rights leaders Frederick Douglass, Thurgood Marshall and Martin Luther King, Jr.; women’s-rights advocates Carrie Chapman Catt and Betty Friedan; Native American activist Leonard Crow Dog; cultural icons Jackie Robinson and singer Marian Anderson; United Farm Workers organizer César Chávez; LGBT rights leader Sylvia Rivera; and Special Olympics founder Eunice Kennedy Shriver. 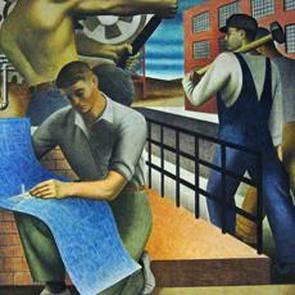 Senior Lecturer David Gariff explores the portrayal of work and workers in classic paintings at the National Gallery of Art, including works by Joseph M.W. Turner, Edgar Degas, George Caleb Bingham, Winslow Homer, and George Bellows. A visit to the special exhibition "The Urban Scene: 1920-1950" featuring prints by artists such as Reginald Marsh, as well as lesser-known printmakers who explored the power and anxiety of the modern city, industry, and labor will also be included in the tour.